An American-Israeli couple are taking legal action against the US Government for not recognising Jerusalem as the capital of Israel. US-born Ari and Naomi Zivotofsky were angered by the refusal of the American embassy in Tel Aviv to register their son's country of birth as Israel after he was born in Jerusalem. Lawyers acting for the couple say the State Department is breaching a law passed by Congress last year which stipulates that Jerusalem must be referred to as the Israeli capital in official US documents. At the time, US President George W Bush approved the law but has since overridden the provision about Jerusalem. 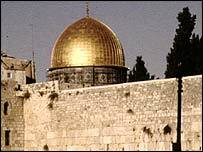 The status of Jerusalem is a highly contentious issue, as the city is claimed by both Israel and the Palestinians. Israel's declaration of Jerusalem as its capital in 1950 has not been recognised by the majority of the international community. The couple's son, Menachem Binyamin, was born in west Jerusalem on 17 October, 2002 - weeks after the law came into effect. 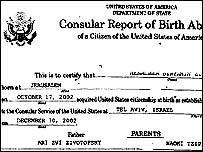 When Mrs Zivotofsky obtained a United States passport for the baby, the place of birth was given only as Jerusalem. A separate registration document left the country of birth blank. The couple, who live in the Israeli town of Beit Shemesh, have instructed lawyers in Washington to take legal action against US Secretary of State Colin Powell, claiming the State Department is violating the Foreign Relations Authorisation Act of 30 September, 2002. A section of the act reads: "For the purposes of the registration of birth, certification of nationality, or issuance of a passport of a United States citizen born in the city of Jerusalem, the Secretary shall, upon the request of the citizen or the citizen's legal guardian, record the place of birth as Israel." The couple's attorney, Nathan Lewin, told BBC News Online, President Bush must obey Congress. "The Congress has clearly told the president that Jerusalem is the capital of Israel and I think the courts will uphold this. "If Jerusalem is in Israel, which the Congress has clearly stated, then there's no reason why the document shouldn't say that - I don't think it's a matter of foreign policy." White House officials have said the provisions relating to Jerusalem conflict with foreign policy and the president has the right to overrule them. The law also called for the US to move its embassy from Tel Aviv to Jerusalem, but this has not happened. The US regards the status of Jerusalem as an issue which must be settled between Israel and the Palestinians.